“What race? Where?” These questions invariably popped up whenever I answered the question: “What race do you have coming up next?” This question is as common as tired legs among the people with whom I regularly keep company. It comes up at least once a week and, on larger group runs, is often asked several times in a single run. 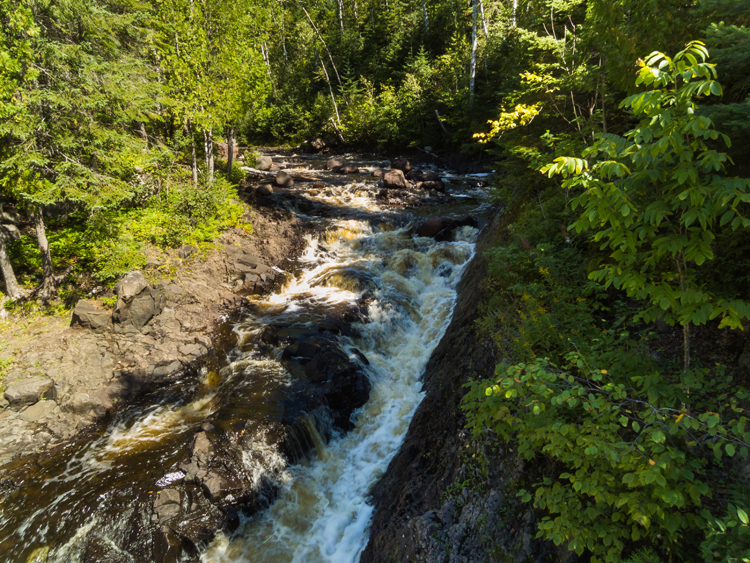 So, to help out, the race is here, in far northern Minnesota, along the North Shore of Lake Superior, just before the fall color explosion. 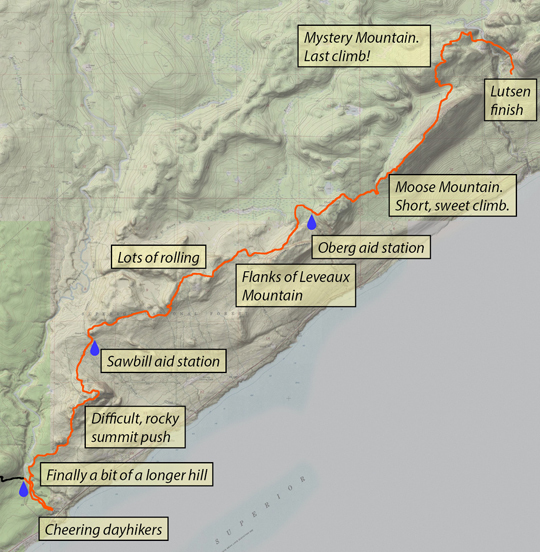 By map, the route isn’t a killer; the course follows the popular Superior Hiking Trail and gains 7800 feet. 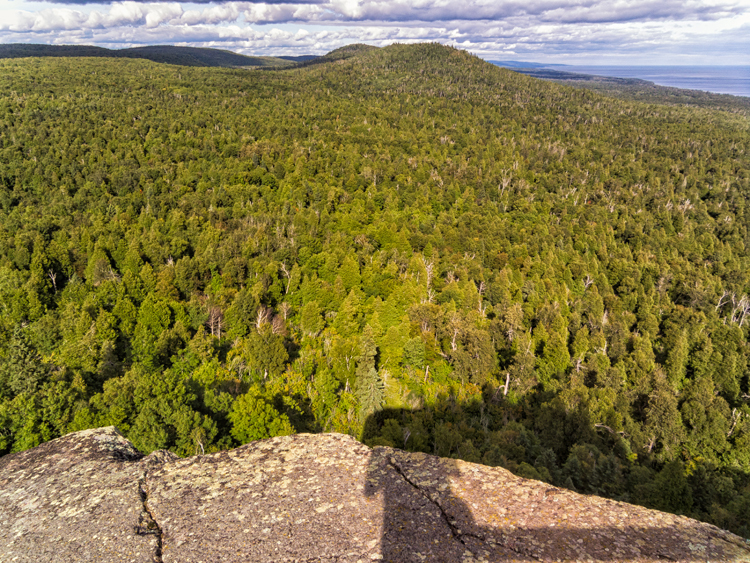 The elevation ranges from 750 feet to 1750 and the biggest climb is only 600 feet. Most of the grades are in the “totally runnable” range. And yet, the course record is just south of 9 hours and the median time for the last couple of years was in the 13 hour range; a comparable race in Colorado (North Fork 50, with similar gain and similar grades) has a median time around 3 hours faster! Minnesota has good runners, so what gives? Clearly, something is lurking, hiding under the canopy of maple, pine, and birch, waiting for victims. 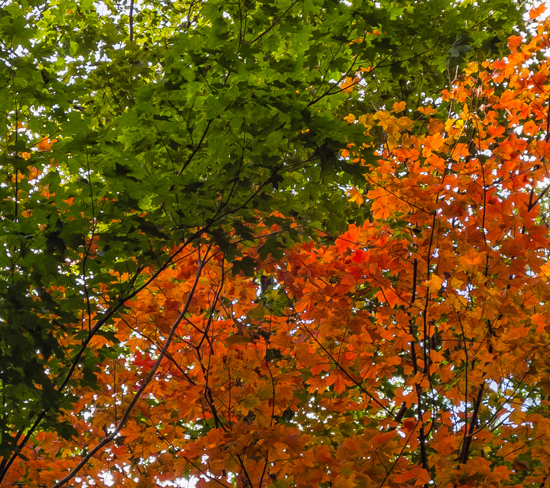 A forest full of maple trees. Imagine how it would look a couple of weeks on! At the prerace meeting, we were told that over much of the course, there was lots of mud and everything was wet. Also, there were, to quote the race-director’s wife, the “bees, bees, motherf-ing bees.” The ground-dwelling hornets were particularly bad this year; nearly everyone marking the course got stung multiple times and 100-milers had been getting stung all day. But that’s why we run the trails! New sights, new experiences, and new things to overcome! 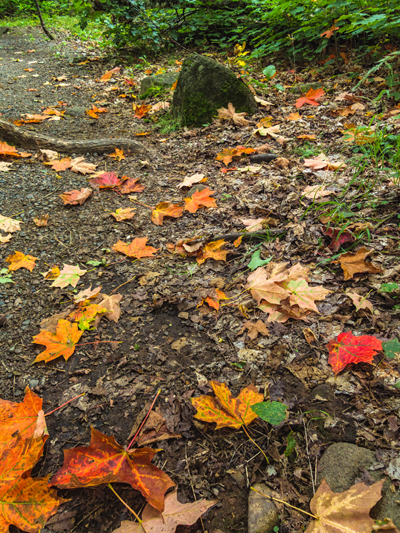 Asphalt is asphalt everywhere, but every trail is unique. I felt ready to run. Outside of perhaps a couple of months, northern Minnesota is probably always cold at 5:30 AM. People shivered and danced as we were warned again about the mud and the bees, but were cheered by the forecast of a perfect running day to come: mid-60s, low humidity, little wind, partly cloudy. We were given updates on the 100 mile runners, many of whom we would be passing on the trail. So that they could be identified, most of them were wearing pink course-marking ribbons on their backs. It was suggested that we give the sleep-deprived runners lots of warning before passing them, so as not to startle them, and give them some encouragement. 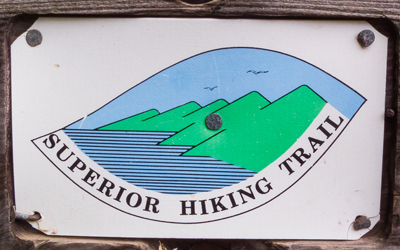 Then, with headlamps blazing, we set out on the road for a kilometer, then turned onto the Superior Hiking Trail. The trail was great. It was moist, but not muddy, with a few roots, some rocks, but really just dirt. I was cruising along at a steady, easy pace on this 400 foot, 2.5 mile climb (the longest, distance-wise, of the day). The climb peaked out near the shore of Egge Lake, with the sky lightening. This had been a pleasant first half hour! The rest of the course to the first aid station was rather uneventful. The trail started rolling, with some of the climbs gaining a bit of steepness. I was feeling good and passed several people through this section and on some of the tighter turns, I was able to see the lead group. I was happy about how I was feeling and my position as I rolled into Sonju Lake (7.3 miles, 1:27:46). I ate some, trying to front-load on the calories, so that I didn’t have to force the issue later in the race if my stomach wasn’t wanting anything. The next section was 4 flat and fast miles, through tight forest that made you feel like you were really flying. I passed several people who had passed me in the aid station and felt great all the while. 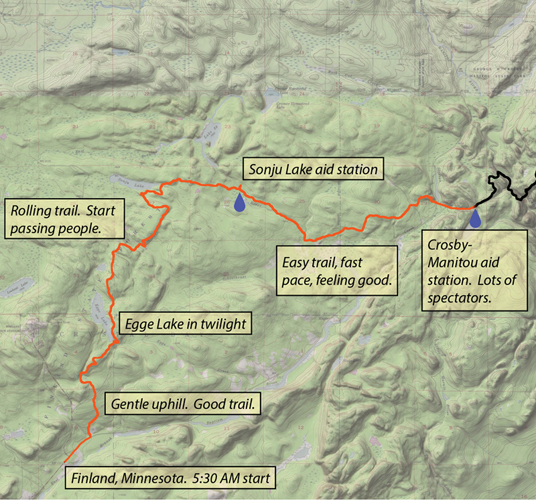 I stepped out of the forest onto Bensen Lake Road and headed toward the aid station. The road was lined with cars and cheering spectators and the music in the aid station was pumping (11.4 miles, 2:14:48). Most of the vertical was in the second half of the race, so I was still hoping to be conservative at this point; my pace on the gentle trail was a bit faster than I had planned, but this generally downhill central section would let me keep moving well and still save my legs for the climbs to come. The lurking monsters in the forest were waiting and ready to pounce. 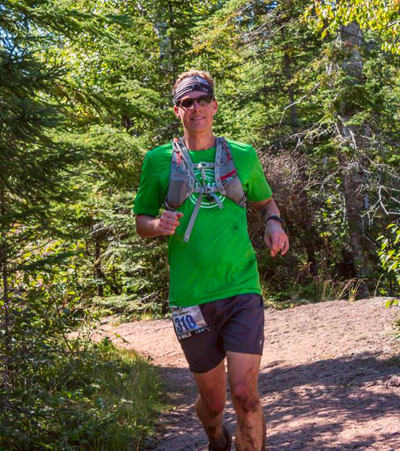 After climbing steeply out of the Manitou River gorge, the reason for the historically slow times was made obvious; the trail became extremely difficult to run quickly and, at times, took on the feel of an obstacle race. Trees had fallen across the trail, areas dense with roots popped up regularly, with rocks invading other sections of the trail. In Colorado, rocky, technical trails are common but are much more runnable. The rocks here were water-eroded: smooth, round, and often covered in moss. Though boardwalks protected many of the small wetland areas, they were so caked in the now ever-present mud that they became VERY slippery. Running for extended periods of time simply wasn’t possible and the constant cycles of run, slow down, bypass obstacle, and run again quickly became mentally exhausting and frustrating. The forest was beautiful, passing from deep and narrow river gorges to cleared, rocky bluffs with views of the lake. Mushrooms, the deep forest’s wildflowers, decorated the sides of the trail. Too bad there were unpleasant results from taking my eyes off the trail for more than a couple of steps! 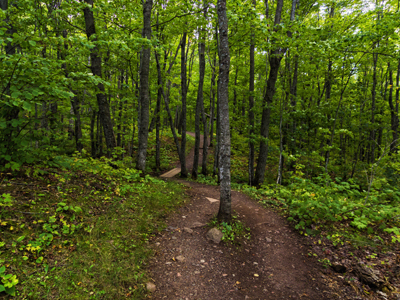 The trail soon after the Manitou River gorge. Look closely and you can see a tree blaze, showing the direction of the trail! The standard for this section: downhill, cross a narrow river gorge, uphill. 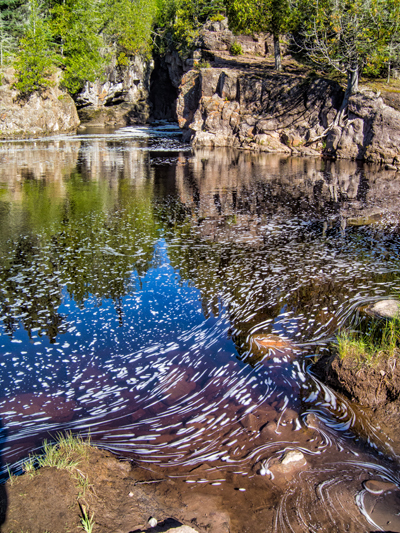 This is the Caribou River. Eventually, the trail exited the thick forest and entered more meadow-like terrain, where it dried out and running was much easier. However, I was mentally fatigued from the technical sections when I arrived at the Sugarloaf aid station (20.9 miles, 4:25:38) to see Kristen and her mom, Karen. I spent 15 minutes in the aid station, trying to shake off the funk. I was also enjoying the company; aside from a few 100-milers I passed, I had been completely alone for the entire distance from the last station. After the 9.5 miles I just did since Crosby-Manitou, I left happy that it was only 5.5 miles to the next station. “Is there a tree down back there?” he asked, in a thick Minnesota accent. “Oh, there are lots of trees down,” I wearily said. “Boy, I really apologize for not getting to those before the race,” he replied, and off he went! Soon after, the trail popped out of the forest, crossed Cramer Road, and we were within sight of the Cramer aid station (26.5 miles, 5:56:46). Ugh. 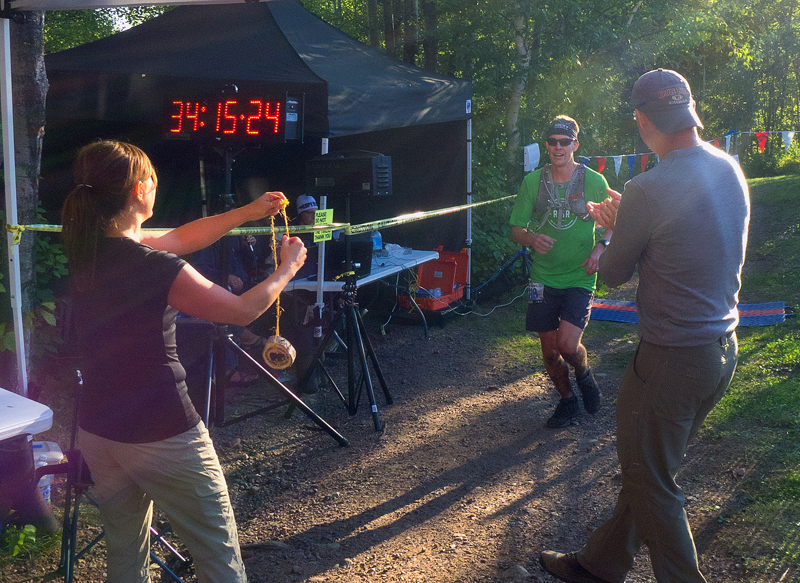 I had been 5 min faster than my goal arrival time at Sugarloaf. I was now 20 minutes behind my goal. I had spent 15 minutes at the last station, but this had felt like an interminable 5.5 miles! After a few minutes with Kristen and Karen, I headed off towards Temperance. This 6.9 mile section is where I had planned to pick up the pace. In reality, this was the darkest, lowest point of my day. And it didn’t take long to get painful. I was passing a 100-miler and his pacer in a dry area, on a lichen-covered rock. The lichen broke free while I was turning a corner, sending my legs out from under me. I landed hard on the rock on my left hip and, immediately, my left calf locked up. The 100-miler and his pacer made sure I was okay before continuing on. I took two salt pills, and started off running again, gingerly testing my calf. Previous cramps had caused long-term pain (days long), but I seemed to feel fine now. I picked up the pace and quickly caught up to the runners who had watched my tumble; they wished me well as I passed them again, this time without incident. For the next 30 minutes, I was able to mostly run, occasionally having to pick around or climb over a downed tree, recover from a stubbed toe, or rub out a smushed foot when it would slip off a root or rock and wedge into a space too small for it. One time I stumbled, I grumbled loudly and a 100-miler up ahead called back, “It’s okay. I do that every time I do that too, though it usually includes some expletives.” Sigh. So many roots and rocks, and they’re all so smooth! We descended into yet another river gorge (Cross River), where I stopped to take a picture of the channeling in the river and reset my focus. The deeply-channeled Cross River. Not a place I think I’d like to find myself in a raft. I managed to run the uphill climb back out, but another 5 minutes later, down I went again! I hit my hands on a tree and the trail (cutting both hands and jamming my thumb). And this time, I cramped in my right calf. I felt broken; all I wanted was to get to the aid station and get off this horrible segment. It was another 22 minutes of rolling trail, then a long downhill. I finally arrived at the Temperance aid station (33.4 miles, 7:42:44). At last! One of the volunteers offering me a sausage noted that I had blood on my chin. I guess that happened in my fall. I think he could tell that I wasn’t feeling good, but I was happy to have that section behind me! 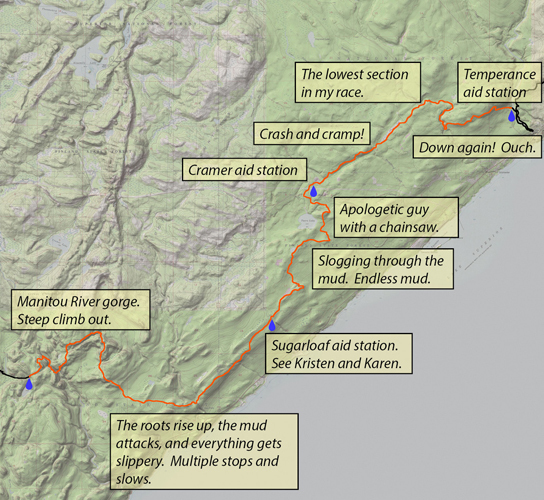 Annotated map for the final section: Temperance to Lutsen. I really wished that they had allowed 50 mile crews to come to Temperance. My mindset and focus were in tatters and my day had shifted to fixing the negative thoughts and trying to enjoy this suffering that I love doing. I was on a beautiful trail, through a beautiful forest in a part of the country I hadn’t seen before. This is why I picked this race! At least I could look forward to some real hills. Besides contributing some variation, the slopes had another benefit: water didn’t settle on the slopes as well. It was dry! 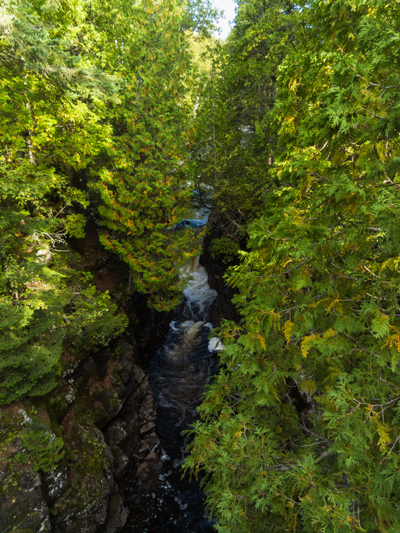 Running to the bottom of the Temperance River gorge was exactly what I needed, made even better by several families out on dayhikes, who gave me some nice words as I ran by. A running rhythm again!! I hadn’t had that since soon after the Crosby aid station. This part of Carlton Peak was gentle, dry, and popular. I enjoyed the company, even if only for a second as I passed. I felt like I was moving well and making progress instead of stalled out, fighting the monsters in the forest. The dark clouds were lifting quickly. Finally running well again! Photo credit: Kelly Doyle. Not to say it was easy. After the gentle lower slopes, the final push to Carlton began. This section was tough, but short, often requiring finding a handhold to pull myself up the very large chunks of rock. At the top, some hikers coming up the other way told me “Nice job! About a mile and a half to the aid station and after this descent, there’s some really nice boardwalk!” Great. Boardwalk. So far, that meant water, which meant mud and slipping around. It wasn’t as bad as before, but my pace was slower on this downhill to the aid station than on the bottom uphill section of the Carlton Peak. 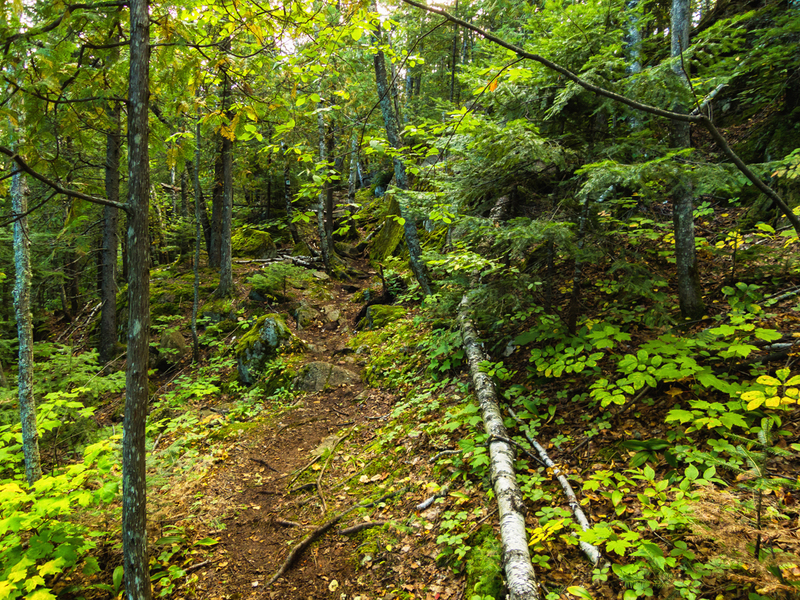 I was wary of falling again, so once the trail entered the flatter areas of the forest, my pace slowed. I arrived, tired but in much better spirits, at the Sawbill aid station (38.8 miles, 9:10:58) to see Kristen, Karen, and Kristen’s dad, David. I spent a long time here. I ate a turkey wrap, changed out of my soaking socks, and enjoyed the company at this busy aid station. Lots of people were taking their shoes off and Kristen’s parents were able to see the carnage that so many wet miles on the trail can do to feet. My feet, fortunately, were fine. I love my DryMax trail socks! The last couple of sections were a series of ups and downs, as the trail hit every little hill and mountain along the North Shore. The going was slow: I was tentative, but my legs still had quite a bit of running left in them. I was in better sprits as I ran most of the 5.5 miles between the aid stations of Sawbill and Oberg. I surprised Kristen and Karen when I arrived at Oberg (44.3 miles, 10:48:09) earlier than I had told them to expect me (David was still on a hike). A little food in the station, then off on the last segment. With the exception of the two larger climbs, I was able to run nearly the full 7.1 mile distance to the finish. At the top of Moose Mountain, just before descending towards Mystery Mountain, I saw a sign indicating ski runs and how to get to the gondola. Lutsen Ski Area. I was close! I pushed hard, alternating between powerhiking and jogging up the final hill to Mystery Mountain. I managed to pass quite a few people in this last stretch and everyone was energized by the approach of the finish line. Just near the end of the trail, there was a final muddy insult before I popped out onto Ski Hill Road and down into Lutsen ski area. People were cheering as I rounded the swimming pool at the Caribou Highlands Lodge and crossed the finish line! Final distance: 51.5 miles. Final time: 12:45:31. 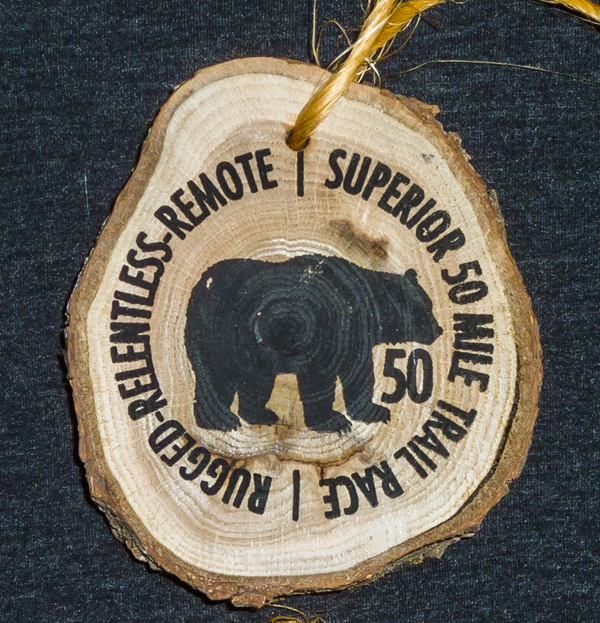 I was handed a very unique finishers medal, which was cut from the branch of a tree and decorated with the symbol of the race (a bear for the 50 mile). I was happy with my position; overall, I placed 26th out of 107 finishers. My first finish in the top 25% overall! In groups, I finished 25th out of 79 men and 19th out of 46 in the Open Male division. Kristen, Karen, and David met me at the finish line and we recapped some of the race as I lay recovering in the grass. There were then some things to attend to: I wanted some of the finish line chili that they had been cooking up, then I needed to hose off my legs and shoes before I could walk into the lodge to take a shower before heading to dinner. A decidedly Minnesotan finishers medal. In my muddy state, I wasn’t allowed into the lodge to get the food, so while I was hosing off, Kristen gathered up some calories for me. Then, while she went to get the car, I took a fast, very cold shower, since the lodge was out of hot water. Brr! 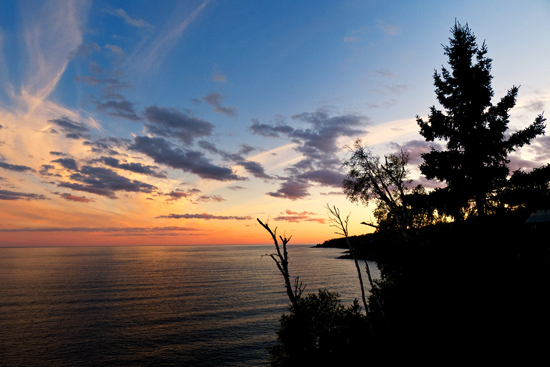 To end out the day, Kristen and I went up to Grand Marais to Sven and Ole’s, a beloved local pizza restaurant. It was a hard race. Despite the loss of focus and variable mental state, I managed to run nearly 90% of the distance. The 10% of the distance walked was slow, picking around mud pits and obstacles; those 5 miles of walking took 2:45 hours! I was unprepared for all the slipperiness and mud. Perhaps some different, more knobbly shoes would have helped, but I think that it was always going to be slow. This year, the median time was 14:07 hours, 25 minutes slower than 2013 and more than an hour slower than 2012. Everyone suffered. 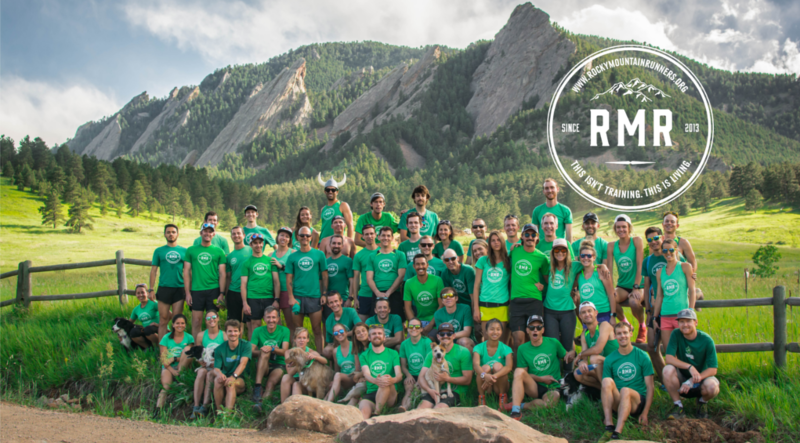 People on the trail were talking about the 25K and 50K spring races put on by the same running company (Rocksteady Running). 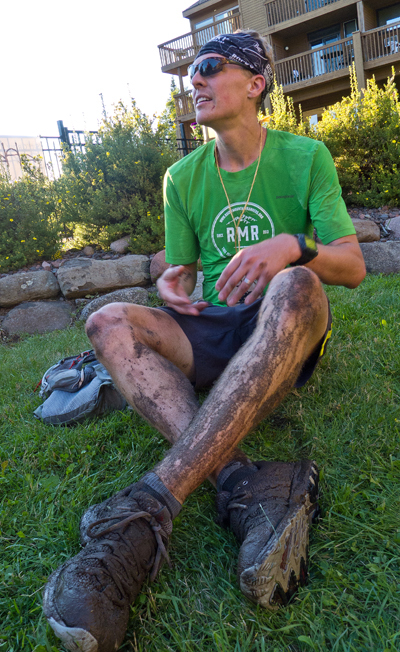 People were telling stories of calf-deep mud for those events, but the same people also reported that they had never seen the trails so muddy at this time of year. Despite my ill preparation for the state of the trails, I could see some definite benefit to training in Colorado and chasing much faster people all over the mountains. I never once felt winded, even at the top of the climbs, and had my highest finish position and best percentile for any race longer than a half-marathon. Every race has its low points, but I’m happy that I picked this race for my first “travel to” race. It was very well organized and executed. I have to thank Rocksteady Running and the race director, John Storkamp (who is also an artist and designed a beautiful, very unique race shirt), for a great event. If anyone is looking for a race in a new part of the country, check this one out! I was happy that David and Karen were able to come up and be part of the event. 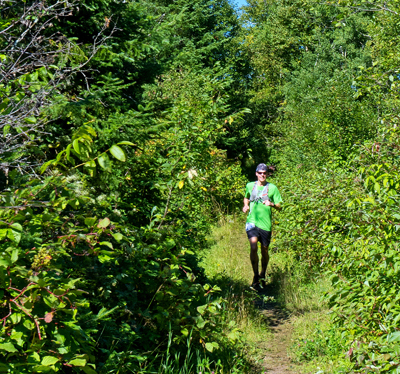 Since Minnesota is a big part of my life, it was great to get out and experience more of the beauty that it has to offer and participate in the local ultrarunning community. 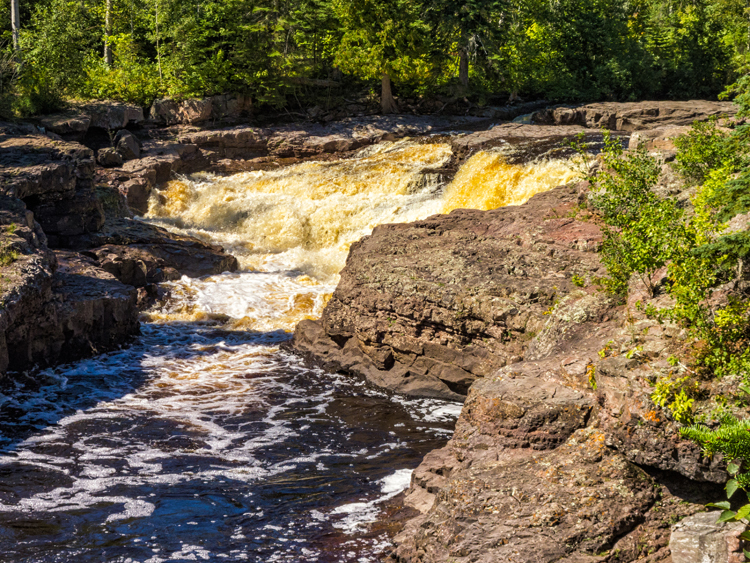 Enjoy some more of that northern Minnesota beauty! …and finally to this peaceful pool. 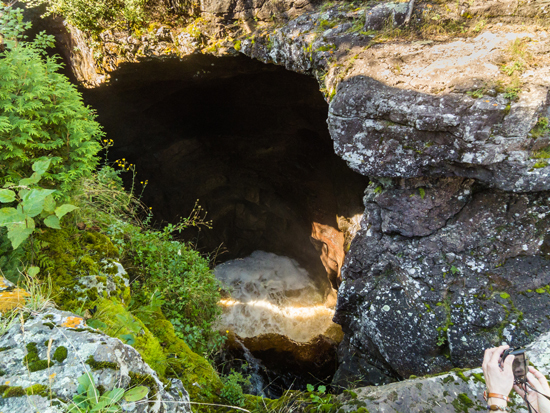 Apparently, it’s so peaceful because it is was a plunge pool for an ancient waterfall, so it’s pretty deep.